1. A graphic record of the contraction of a muscle as a result of electrical stimulation or the electric activity of a muscle either spontaneous or in response to artificial electric stimulation. 2. A record of the spiking electrical discharge of a muscle, motor unit, or muscle fiber generated in response to neutral impulses or arising spontaneously. 3. A record of eye movements when reading, obtained by measuring the potential difference between an electrode placed at the center of the forehead and one placed at the temple. 4. A record of the intrinsic electric activity in a skeletal muscle. Such data aid the diagnosis of neuromuscular problems and are obtained by applying surface electrodes or by inserting a needle electrode into the muscle and observing electric activity with an oscilloscope and a loudspeaker. Some electromyograms show abnormalities; such as, spontaneous electric potentials within the muscle under study, and help pinpoint lesions of motor nerves. Electromyograms also measure electric potentials induced by voluntary muscular contraction. A field programmable logic device with transistor rather than fuse links for controlling the signal paths in its fixed array of logic blocks and connections. The recording of the electric currents produced by eye movements. 1. A record of the speed and direction of eye movements between two fixed points, determined by registering differences in electric potential which is used to detect retinal dysfunction. 2. A record of the standing voltage between the front and back of the eye which is correlated with eyeball movement and obtained by electrodes placed on the skin near the eye. 3. A record of the difference in electrical charge between the front and back of the eye that is correlated with eyeball movement; as in REM sleep, and that is obtained by electrodes placed on the skin near the eye. 1. A record of the action currents of the retina of the eyes produced by visual or light stimuli. 2. A graphic record of the electrical activity of the retina or the electric discharges of the eye retina. 3. A record of the electric variations of the retina when stimulated by lights which is made by placing one electrode over the cornea, and the other electrode over some indifferent region. 4. A recording of the electrical potentials evoked in the retina and ocular fundus (bottom of a hollow organ) in response to a visual stimulus. A graphic record or curve showing the action potential of the salivary glands, obtained with an electrically operated instrument. A record of the electrical activity of the spinal cord. 1. An electroencephalogram (tracing of the electric impulses of the brain) showing differences in electric potential recorded at various levels of the corpus striatum (either of two gray and white, striated bodies of nerve fibers located in the lower lateral wall of each cerebral hemisphere). 2. A depth recording obtained from electrodes inserted into the corpus striatum (a mass of striped gray and white nervous tissue in each hemisphere of the brain). A depth recording obtained from electrodes inserted into the thalamus or the large egg-shaped mass of gray matter situated in the posterior part of the fore brain which relays sensory impulses to the cerebral cortex. The thalamus relays sensory information to the cerebral cortex, the thinking and reasoning part of the brain, and the part that receives information from the senses, directs the conscious movements of the body, and regulates the perception of touch, pain, and temperature. 1. A record of the electric changes occurring in the vagus nerve: The technician, Mr. Jackson, studied the electrovagogram of the patient before conferring with Dr. Smith. The vagogram shows how the vagus nerve supplies nerve fibers to the pharynx (throat), larynx (voice box), trachea (windpipe), lungs, heart, esophagus, and the intestinal tract as far as the transverse portion of the colon. This nerve also brings sensory information back to the brain from the ear, tongue, pharynx, and larynx. 2. Etymology: from Latin vagus, "wandering" and it is appropriate because the vagus nerve wanders all the way down from the brainstem to the colon, which is a long wandering way. The record obtained by encephalography (radiographic representation of the brain). 1. A radiograph of the intestines. 2. An instrumental tracing of the movements of the intestines. 2. A short poem, often expressing a single idea, that is usually satirical and has a witty ending or an ingenious turn of thought: Another example of an epigram is a brief saying that's either true and not new or new and not true. A good epigram to remember: "If you think education is expensive, try ignorance and see what you get." 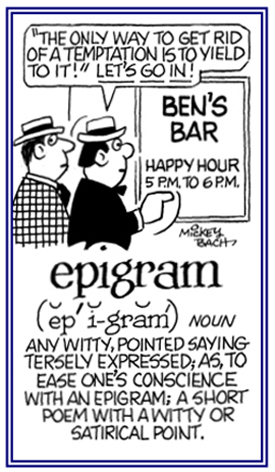 You may go to the Benjamin Franklin: A Genius of Many Gifts page to see several examples of epigrams. 1. Relating to, or like, an epigram; terse and ingenious in expression. 2. Containing, or favoring, the use of epigrams.